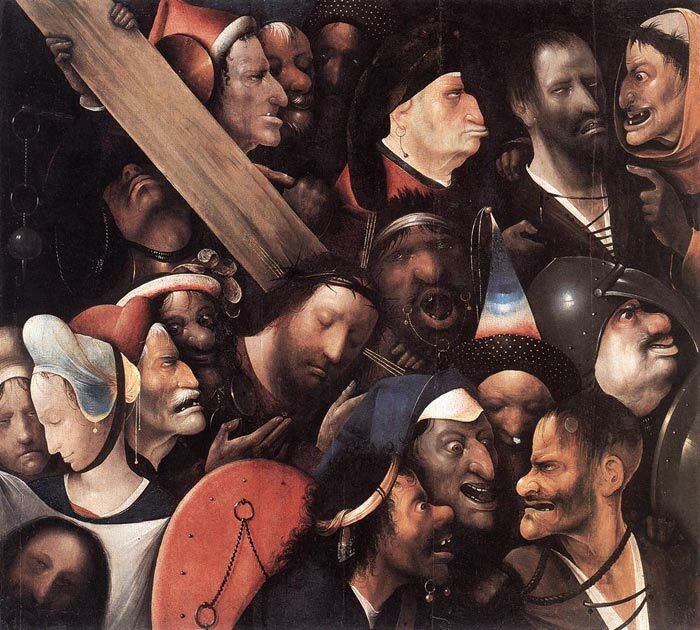 Christ Carrying the Cross is an exceptionally dramatic painting of Bosch , with a bold composition made up of closely packed heads for which no parallel exists in the art of the period around 1500. It is generally considered to be a late work and one of Bosch's greatest creations. The antithesis between good and evil, which was so crucial to Christian belief in Bosch's time, is raised to a climax. The painting is a peerless study of human facial expressions and demonic visages. Yet the chaotic and caricatured elements inserted by Bosch are never overwhelming and the painting seems to observe a complex balance of parallels and contrasts that emphasizes the serenity of Christ's gently modelled face in the centre. Amid all the tumult, we make out the clear profile of St Veronica withdrawing from the mob, the image of Christ's face - the 'vera icon' on her cloth. SPECIAL NOTE : The painter will make the reproduction as close to the original oil painting as possible. If you want your painting to alter from this likeness, please email us and " Christ Carrying the Cross, 1480 " will be reproduced according to your special requirements.